A few weeks ago, I took the family to Mount Evans, one of the 14ers on the Front Range of the Rocky Mountains. Mount Evans is great for kids because you can drive almost to the top – it’s noted for having the highest paved road in North America. Before you start on the fee road to the top, you pass Echo Lake. We didn’t pass this by though, we walked around Echo Lake. The trail around Echo Lake speaks volumes about fuel for wildfires. There are many places where you can count more trunks down than trees still standing. In some spots you can see where trunk piles atop trunk creating a dense network of dry consumables. FEMA defines wildfire as “…an unplanned fire that burns in a natural area such as a forest, grassland, or prairie,” but these wildfires spread to areas of built infrastructure including our communities. Fires are burning throughout the West this year. California and Colorado are in the news everyday. Living in Denver and being a regional emergency coordinator for a federal agency I can tell you that we are very aware of the fire danger. 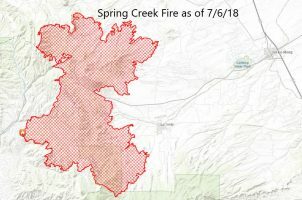 It’s not just the large fires either – the fire danger affects our lives: many Colorado counties have fire bans (the firework tents closed down tight a week before the Fourth) and fire fighters across the Denver area have stayed busy despite the bans. This year the West is in the news and yes, there is fire “season” that moves across the country but the risk exists year round. What about elsewhere? In 2012, New York’s Long Island experienced fires. In 2016, eight Southeastern states experienced major fires. This year a wildfire in Northern Minnesota burned 4000 acres. The Spring Creek Fire is burning right now in Costilla and Huerfano Counties of Colorado. As of Friday, July 6, it has burned more than 105,000 acres, destroyed more than 130 homes and is 35 percent contained. The graphic shows the footprint of this fire – it’s considered the third largest in state history to this point. Fifteen hundred firefighters are battling the blaze and were helped recently by rains, which didn’t stop the fire but did slow it down. When there are so many fires across the West firefighting resources get tight. The 36 large fires (as of July 6) have to compete for a limited number of aircraft, firefighters and other resources. This fire, like many others burning right now, has a variety of impacts. Homes and livelihoods have been destroyed. Roads are closed. Power is out. Evacuations are mandated. There is risk to cultural and historic interests. It’s easy to maintain situational awareness of the current national fire situation. You can navigate to the website of the National Interagency Fire Center (NIFC) for up-to-date information: www.nifc.gov. The NIFC runs the National Information Coordination Center (NICC) which “…serve[s] as a focal point for coordinating the national mobilization of resources for wildland fire and other incidents throughout the United States.” There you can find situational reports listing the major fires. For an interactive mapping tool visit: inciweb.nwcg.gov. For emergency information always know your local official sources including city, county and state emergency management. These are the right sources for information on evacuation and other critical matters. As public administrators, we prepare for all hazards. Our facility managers likely have a fire section of their Occupant Emergency Plans (OEPs). But wildfires are much different than a fire started in the electrical closet. For preparedness information you can visit the www.nifc.gov site and you can visit FEMA’s Ready site: www.ready.gov/wildfires. Aside from the obvious first responders, many functions within the public administration realm have to respond to wildfires. Roadways and other transportation infrastructure have to be repaired. Power infrastructure has to be restored. Erosion risks have to be mitigated. Health and social services respond. The list is long. Even departments or agencies that don’t have a response or recovery role after the wildfire hazard should be prepared. Facility plans should be up-to-date. Means should exist to people and property from the hazard. An evacuation even brings into play important considerations of continuity of operations.